In October, while North Carolinians were battening down the hatches for the second major storm in a month, $31,000 flowed into the coffers of five lawmakers from a nonprofit organization keen on drumming up business along the coast. With just a few weeks left until the general election, executives with the Resource Institute and Atlantic Reefmaker, a for-profit company and contractor, contributed to Sen. Pro Tempore Phil Berger, House Speaker Tim Moore, Sen. Harry Brown and Reps. Kyle Hall and Dana Bumgardner. When added to previous campaign contributions, these and other donors have given nearly $150,000 to just a handful of powerful Republican lawmakers since 2016. It’s unclear why the financial piling on was necessary. As Policy Watch reported in July, the Resource Institute gave $116,000 to various political campaigns, including Moore, Berger and Hall. After two years of giving, the money finally paid off: Lawmakers inserted into the budget bill a $5 million grant to the Resource Institute — pass-through money from the state Department of Environmental Quality, which was surprised by the appropriation. Now, though, the Hurricane Florence Disaster Relief Bill, which passed last week, has narrowed the scope of work from the coast in general — which, judging from a tepid reception by shoreline protection officials, was a non-starter — to Topsail Island in Pender County. The idea of Topsail had been floated this summer when Darrell Westmoreland of Atlantic ReefMaker told Policy Watch that the company wanted to deploy this relatively new technology to stabilize the New River Inlet. 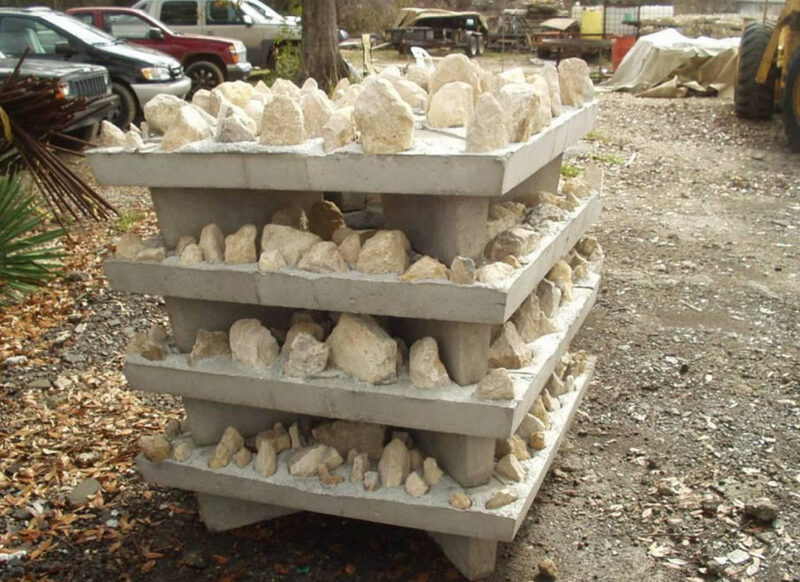 Developed in Florida, the Reefmaker is a stack of molded concrete trays set with rock, such as granite. They are constructed on fiberglass pilings installed on the sea floor or riverbed. The purpose is to break up wave energy, while allowing water, fish, sand and other aquatic life to pass through. Atlantic Reefmaker recently conducted a full-court press on the Department of Transportation board. On Nov. 7, Randy Boyd, an engineer with the firm, provided more details on the technology. Some board members seemed impressed, but others had questions about its longevity. UNC Wilmington is under contract to monitor the Reefmaker’s performance, Boyd told the board. Meanwhile, on the other side of the state, Resource Institute has its hands in dozens of stream restoration projects. In addition to the $5 million the organization received in the budget, it got $1 million — although not by name — to work with Appalachian State University to restore part of Payne Branch Creek in Boone. That apparently is not enough: At a recent Clean Water Management Trust Fund meeting, Resource Institute asked for yet another $625,000 to complete that project. But the CWMTF board questioned its staff’s ability to monitor the Payne Branch Creek project because the money came from the legislature. Resource Institute is accountable only to lawmakers — including those who benefit from the campaign contributions. Ultimately, Resource Institute did not receive its full request from the trust fund — just $425,000 in a provisional grant, allocated if more money becomes available. The group did receive a portion of its third round of funding — $425,000 — for a 33-county Western Stream Restoration project. Resource Institute had asked for $1.5 million. The project has already received nearly a million dollars over the past three years; total cost could approach $5 million. Previous PostUNC-Chapel Hill Trustees meet Monday on Silent Sam’s fateNext Post Government watchdog complaint: Did a state senator and a Superior Court judge break campaign finance laws?